Charles Edward Stuart, called the "Young Pretender" by his enemies, the "Young Chevalier" by neutrals, "Prince of Wales" and "Prince Regent" by his partisans, "Prince Edouard" by the French, "Ned" by his intimates, as we read in letters of Oliphant of Gask, and "Prince Charlie" by later generations, was born at Rome, December 31, 1720. His father was James VIII., of Scotland, and III. of England, according to the Legitimist theory; his foes called him "The Pretender," partly on the strength of the old fable about the warming-pan, so useful to the Whigs. No sane person now doubts the genuineness of James' descent from James II., but the nickname of Pretender still sticks, though Boswell tells us that George III. particularly disliked an appellation which "may be parliamentary, but is not gentlemanly." James III., or the Chevalier de St. George, was taken up by Louis XIV. on the death of James II., in France. He is said to have displayed courage in several battles in Flanders, but his attempt to assert his rights in 1715 was a melancholy failure. James showed melancholy and want of confidence; he soon left Scotland for the Continent, and the best that can be said for his conduct is that he endeavored to compensate the peasants whose houses were destroyed in the military operations of "the Fifteen." Unable to reside in France, he retired to Rome, a pensioner of the Pope, and entertained with royal honors. In 1719 he married Clementina Sobieski, a granddaughter of the famous John Sobieski, who delivered Europe from the Turks. Their eldest son, Prince Charles, appears to have inherited the spirit and daring of his Polish ancestors, which animated him throughout his youth, and were extinguished less by Culloden than by the treatment which he received from the French court, by his imprisonment in Vincennes in 1748, and by the unrelenting animosity of the English Government, which made him a homeless exile living mysteriously in hiding on the Continent. Heart-broken by these misfortunes and by other disappointments, Charles developed an unreasoning and sullen obstinacy, which alienated his adherents, while the habit of heavy drinking, learned in his Highland distresses, ruined his head and heart, and converted the most gallant, gay, and promising of princes into a brutal dipsomaniac. The education of Charles was casual and interrupted. Now he was in the hands of Protestants, now of Catholic governors and tutors, as the advice of English adherents, or the wishes of his devout mother, chanced to prevail. There were frequent quarrels between James and his wife, turning partly on the question of education, more on the jealousy which the queen conceived of the Countess of Inverness. The Pope sided with the queen in these melancholy broils, and James's private life (which was not faultless) was much more subject to criticism and interference than that of his at least equally lax rival on the English throne. A second son, Henry Benedict, Duke of York, was born in 1725, and, at one time, was regarded as of more martial disposition than Prince Charles. As the elder, Charles was first under fire, and at the siege of Gaeta, in 1734, while a mere boy, he displayed coolness, daring, and contempt of danger. Young Henry, aged nine, "was so much discontented at being refused the partnership of that glory and that danger, that he would not put on his sword till his father threatened to take away his garter too," says Murray of Broughton, in a letter dated 1742. In later life the Duke of York showed no military aptitude. A kind of progress which Charles made through the cities of Italy, aroused his desire to be a prince in more than name. The English Government quarrelled with the Republic of Venice about the royal honors paid to the prince, and his ambition was awakened. His education, we have said, was very imperfect. Murray of Broughton, indeed, credits him with Latin, Greek, history, and philosophy. But his spelling in both French and English was unusually bad, even in an age of free spelling; he wrote epoles for epaules, "Gems" for "James," "sord" for "sword." He did not neglect physical exercise; was wont to make long marches without stockings, to harden his feet (as he told a follower during his Highland distresses). He was a good shot, fond of hunting, and, about 1742, was probably the first man who ever played golf in Italy. Murray describes him as "tall above the common stature, his limbs cast in the most exact mould, his complexion of an uncommon delicacy, all his features perfectly regular and well turned, and his eyes the finest I ever saw." Whether they were blue or hazel is undecided; they are hazel in at least one contemporary portrait. As a boy, engravings show him pretty, merry, and buoyant; an air of melancholy may be remarked as early as 1744. With bright nut-brown hair, golden in the sun, and worn long beneath his peruke, he certainly justified the endearing name of "Bonny Prince Charlie." The distinction of his air could be concealed by no disguise, as his followers loved fondly to declare. He certainly had the royal memory for faces. At the opera, in 1773, he noticed an English officer opposite, whom he sent for. The gentleman visited the royal box, accompanied by a Scotch servant. "I have seen you before," said Charles to this man. "You once brought me a message at Falkirk, in 1746." Such was Prince Charles when, in 1742, Murray of Broughton became acquainted with the royal exile in Rome, and was appointed secretary for Scotland. With Lochiel and others, Murray formed a Jacobite association in his native country. Negotiations were begun with the French court, which hung off and on, as did the English Jacobites. They would rise, if France supplied men, money, and arms. France would do this if sufficiently assured of support in England. The king had no enthusiasm for the enterprise. He was weary of promises and of leaning on that broken reed, Louis XV. Murray intrigued in Scotland, Lord Elcho in England, Kelly at the French court. Lord Semple confused all by false hopes; Charles was much in the hands of Irishmen--Sheridan, Sullivan, O'Brien, and O'Neil; already a "forward," or Prince's party was growing, as opposed to the waiting policy and party of the disheartened and unambitious James. To what extent English Jacobites were pledged is uncertain. There was much discontent with the Hanoverian dynasty in England, but the dread of popery was strong among the middle classes. The butchers were advised that Catholics ate no meat on Sundays, the official clergy preached Protestant sermons, the Jacobite gentry feared for their lives and estates in case of failure, and the sagacity of the Government has never revealed the extent to which the Duke of Beaufort and others were committed to King James. The universities, the sporting squires, and the smugglers drank to "The king over the water," but there enthusiasm began and ended. 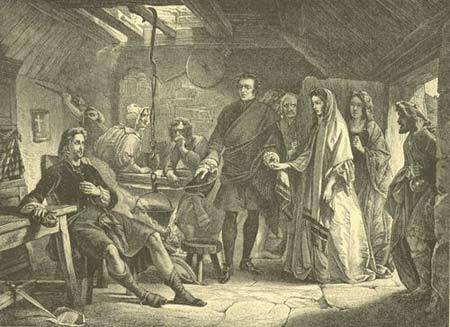 The First Meeting of Prince Charles with Flora Macdonald. More was expected, and till assured of more, France held aloof, while making promises enough. Even the Highland chiefs said that without a French army nothing could be done. 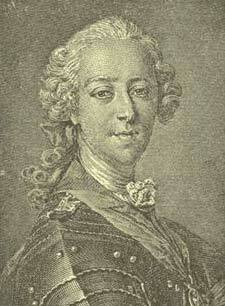 In 1744 Charles left Rome, under pretext of a hunting party, concealed his withdrawal with great skill, and reached Paris. He was obliged, however, to be incognito and was not received by the king. An invading force was crowded on board ship. The chance seemed excellent, England's forces being mainly abroad; but the old friends of England, the winds, drove the battered fleet back into harbor, and Charles in vain tried to persuade the Earl Marischal to accompany him to Scotland in a small fishing vessel. One result followed the reception of Charles by France, niggardly as that reception was--war with England broke out, and the French army of invasion was moved from Dunkirk to Flanders. The prince, not permitted to serve in the French army, returned to Paris, where he had been falsely assured by Semple and AEneas Macdonald that England was ready to rise for him. Murray, who visited him in Paris, tried to dissuade him from a wild venture; in Scotland he found the chiefs of his own opinion, but the letter carrying the news never reached the prince. His Irish friends urged him on; "the expedition was entirely an Irish project." He borrowed money from his bankers, the Waters, he pawned his share of the Sobieski jewels, and, with a privateer man-of-war and a brig, La Doutelle, he left Belleisle on July 13, 1745. Neither the French court nor his father knew that, attended only by seven men, "The Seven Men of Moidart," he had set out to seek for a crown. The day before he embarked he wrote to James; he said that no man would buy a horse, nor trust a prince, that showed no spirit. "I never intend to come back," he added. So, dressed as a student of the Scots College, he started. He lost his convoy, the Elizabeth, on the way, after a drawn battle with the Lion (Captain Brett). Resisting all advice to turn back, as AEneas Macdonald, who accompanied him, narrates, he held on in La Doutelle, and reached Erisca, an islet between Barra and South Uist, on August 2, 1745. An eagle hovered over his ship, and Tullibardine hailed the royal bird as a happy omen. But he found himself unwelcome. Boisdale bade him go home; "I am at home," said the prince. He steered for Moidart, the most beautiful but the wildest shore of Scotland, a region of steep and serrated mountains, of long salt-water straits, winding beneath the bases of the hills, and of great fresh-water lochs. Loch Nahuagh was his port; here he received Clan Ranald, whose desolate keep, Castle Tirrim, stands yet in ruins, since "the Fifteen." Glenaladale (whose descendants yet hold their barren acres), Dalilea, and Kinlochmoidart (now, like Clan Ranald, landless men) met him with discouraging words. But, seeing a flash in the eyes of a young Macdonald, of Kinlochmoidart, Charles said, "You will not forsake me?" "I will follow you to death, were no other sword drawn in your cause." "I cannot see anything but ruin and destruction to us all in case we should think of a retreat;" his forces in flight would lose heart, his enemies would gain confidence. All this was true, but all this was unavailing. Months were spent in unimportant movements. Cumberland, meanwhile, instructed his men in the method of meeting a Highland charge, and deceiving the parry of the Highland shields. It was known that France would lend no substantial aid, and a French subsidy of 30,000 Louis d'or came too late, after the battle of Culloden, and was buried at the head of Loch Arkaig. One last chance Charles had: Lord George proposed, and Charles eagerly seconded, a night surprise at Nairn. But the delays on the march, and the arrival of dawn, made Murray command a retreat, and Charles's faith in him was irretrievably gone for the time, though he later expressed in writing a more worthy opinion. With 10,000 well-fed men against 5,000 who were starving, Cumberland had every chance of victory at Culloden. The Macdonalds, placed on the left wing, would not charge. Keppoch's men were discontented because they were not allowed to have a Catholic chaplain. Crying out, "The children of my clan have forsaken me," Keppoch charged alone, and died the death of renown. Beaten and blinded by a storm of snow in their faces, the Highland right clove the ranks of Monro and Burrell, only to fall, in layers three or four deep, before the fire of Sempill's regiment in the second line. The whole English force advanced; Charles rode to his second line, and offered to charge with them. His officers told him that it was in vain; Highlanders once beaten would not rally. (MS. "Lyon in Mourning," and MS. of Stuart Threipland at Abbotsford.) Charles was hurried off the field by his Irish tutor, and fled to Lord Lovat's, at Gortuleg. A story of his lack of courage, told by Sir Walter Scott on the authority of Sir James Stewart Denham's recollections of Lord Elcho's MS., is erroneous. Lord Elcho's MS. does not contain the statement. What he objects to is Charles's refusal to meet the fragments of his army at Ruthven, in Badenoch, whence they hoped to wage a guerilla warfare. Lord George Murray himself admits that the project was impossible. Charles, however, should have gone to Ruthven, but he distrusted Lord George; and his hope of a speedy voyage to France, where he expected to receive aid in men and money, was frustrated. It is needless to repeat the tale of Cumberland's almost incredible butcheries, cruelties, and robberies, or to tell of the executions accompanied by the torture of disembowelling the living man. The story of Charles's wanderings and distresses is narrated best in the MS. "Lyon in Mourning," partly printed by Robert Chambers, in "Jacobite Memoirs." No words can overpraise the loyalty of the starving Highlanders; neither English tortures, nor the promise of #30,000, ever moved one man or woman from their constant faith. Only one hungry boy whom Charles had fed, attempted to betray him, but was not believed. As for the prince, he is briefly described by a companion as "the most prudent man not to be a coward, the most daring not to be foolhardy, whom he had ever known." He showed a constant gayety, singing and telling tales to hearten his followers. His resource was endless; he was by far the best cook and the least fastidious eater of his company. He could cook a dish of cow's brains, or swallow raw oatmeal and salt-water. Surrounded by English cordons, through which he slipped at night up the bed of a burn, when the sentinels had reached their furthest point apart, Charles led a little expedition which cut off the cattle intended for the provender of his enemies. (MS. "Lyon in Mourning.") He would not even let a companion carry his great-coat. He knew every extremity of hunger, thirst, and cold; and perhaps his most miserable experience was to lurk for many hours, devoured by midges, under a wet rock. Unshorn, unwashed, in a filthy shirt, his last, he was yet the courteous prince in his dealings with all women whom he met, notably with Flora Macdonald, the stainless and courageous heroine of loyalty and womanly kindness. At last, late in September, 1746, Charles, with Lochiel and many others, escaped in a French barque from Loch Nahuagh, where he had first landed. It has been said of him by his enemies, especially by Dr. King, a renegade, that he was avaricious and ungrateful. Letters and receipts in the muniment room of a Highland chief show him directing large sums, probably out of the Loch Arkaig treasure, to be paid to Lochiel, to "Keppoch's lady," and to many poor clansmen. The receipts, written in hiding, and dried with snuff or sand, attest that the money came to the persons for whom it was intended. Charles' expedition could only be justified by success. That it failed was due to no want of courage, or audacity, or resolve on his part, but to the very nature of a Highland army, to the jealousies of Irish and Scotch, to the half-heartedness of his English partisans, and to the English horror of his father's religion. By his own creed he held very loosely. From this point there is little historical or personal interest in the life of Charles. His father, James III., died in 1766, and was buried as a king. Charles hurried from Bouillon to Rome; his brother, the cardinal, tried to secure his recognition by the Papal Court, but the Pope dared not, and no other government chose to defy the English Ministry. Charles's life was spent, now in seclusion, now in society; he still was fond of shooting, of music, and the drama; he still retained his grace of demeanor when he happened to be sober. Late in 1771 he went in disguise to Paris, where he accepted a pension from France, and a beautiful bride, Louise, Princess of Stolberg, descended from the Earl of Ailesbury into whose arms Charles II. fell under the stroke of his fatal illness. The ill-matched pair were married on Good Friday, April 17, 1772. At first Charles behaved with more sobriety and good humor than usual. A child of the marriage was expected, at least by the Scotch Jacobites, in 1773. There is a legend that a child was actually born, was intrusted to Captain John Carter Allen, was brought up by him as his own, and this infant, grown to manhood, became the father of two gentlemen calling themselves John Sobieski Stolberg Stuart and Charles Edward Stuart, Counts of Albany. They lived till late in the present century, were picturesque figures in society, and writers of some spirit and vigor. For long they were much cherished by some noble Highland families. Charles, the younger, has left descendants. It is needless to discuss here the authenticity of these claims. Charles's relations with his wife were on the pattern of his relations with his mistress. He was jealous, and brutal beyond description; she was courted by Alfieri, the poet, and, after fleeing from her husband to a convent, she united her fortunes with Alfieri's. On his death she chose a young French painter, Fabre, as his successor, and to him she left her rich collection of relics, spoils of the poet and the king. A beautiful, witty, and engaging woman, she was long a centre of society in Italy. She died in 1824. In 1784 Charles sent for his daughter by Miss Walkinshaw. Both had long been maintained by the cardinal. He made her Duchess of Albany, medals were designed, if never struck, representing her as spes ultima et exigua, "the last frail hope," of the Stuarts. For the last time, in conversation with a Mr. Greathead, the old spirit blazed out. His face brightened, he began the tale of his campaign, but, when attempting to narrate the butcheries of Cumberland, the cruel executions in London, he fell on the floor in convulsions. He used to solace himself by playing on the pipes, and at the sound of the martial music which he had heard on three stricken fields, he was able to live in the past. On January 31, 1788, the anniversary of the death of Charles I., Charles Edward passed away from earth. His daughter did not long survive him; she was killed by a fall from her horse. Henry now took the title of Henry IX. "by grace of God, not by the will of men." He died in 1806; the French had stripped him of all his property, even the famous Sobieski rubies were gone, and he was in receipt of a pension from the English Government. In 1819 George IV. erected a monument by Canova, in St Peters at Rome, to "James III., son of James II., King of Great Britain, to Charles Edward, and Henry, his sons, the last of the Royal Stuart line. Blessed are the dead who die in the Lord." Sir Walter Scott visited this alone of Roman sights, in 1832, just before he came home to die. Better lo'ed ye canna be,"
sung by the lads of a Scotch village, one feels that Charles Stuart did not wholly fail; the song outlives the dynasty, and relics of Prince Charlie are fondly cherished, while no man cares a halfpenny for his Hanoverian rivals. The best life of Prince Charles is that by Mr. Ewald (London, 1875). Mr. Ewald alone has used the State Papers at the Record Office. Lord Stanhope's and Mr. Chambers's "Histories of the Forty-five" are also excellent; as are "Jacobite Memoirs," selected from Bishop Forbes's MS. "Lyon in Mourning." These works, with the contemporary tracts, and some MSS., with Lord Stanhope's "Decline of the Last Stuarts," and the Stuart Papers at Windsor, as given in Browne's "History of the Highland Clans," have been consulted in compiling this study of Prince Charles.